Sendai Station is the largest station in Sendai, and also its focal point. The area around Sendai Station, and in particular the area west of Sendai station can be considered the most central one and many of the city's sights can be found in this area. Sendai Station is a large station, the busiest north of Tokyo. The heart of the city of Sendai extends west of the station (West Exit). In this area there is the commercial heart of the city, with many large shops and shopping centers, but also several covered shopping arcades (shōtengai) full of small shops. Also a few minutes walk from the west exit there is the nightlife area of Kokubuncho, the skyscrapers AER and SS30. Other city attractions, like the Aoba Castle's Park or the Sendai Mediatheque are located to the west of the station, although they are a bit far to reach on foot. East of the station (East Exit) you will find the Sendai branch of Yodobashi Camera and another shopping center (BiVi Sendai) in the immediate vicinity, a little further the baseball stadium (Miyagi Baseball Stadium) and nothing else. The interesting part of the city lies all to the west of Sendai Station. 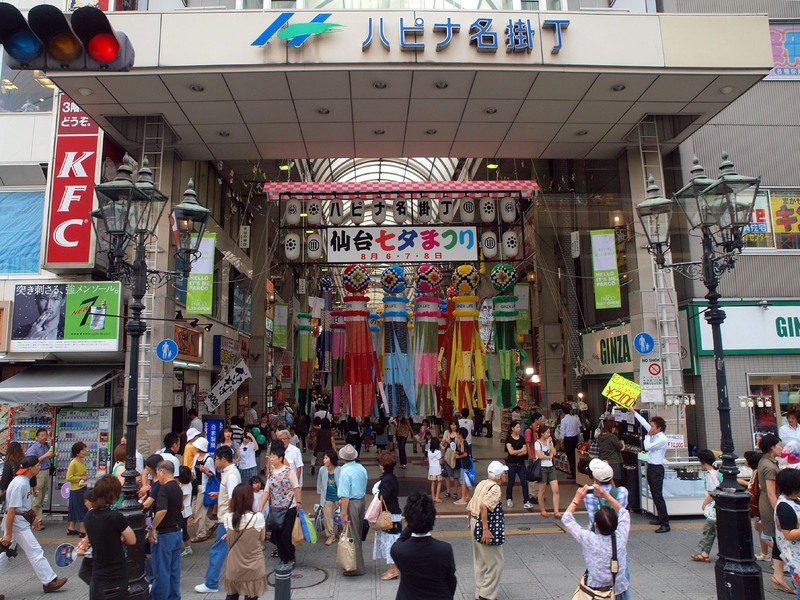 The area to the west of Sendai Station is characterized by two long, typical Japanese covered shopping arcades (shotengai), full of shops and other commercial activities, cafes, restaurants, game centers and even tiny Shinto shrines. If you are in Sendai during a rainy day, you can still spend some time in this part of the city. The galleries change their names several times, but to avoid confusion it is enough to know that all together they have the shape of a T.
The nearest entrance from Sendai Station is about 400 meters away, right in front of the AER Building. From here it starts a long shopping arcade, about 800 meters long, that changes its name 3 times (first Hapina Nakakecho, then Clis Road, lastly Oomachi). At the end of these 800 meters, the covered arcade continues both to the left (Sun mall Ichibancho), and to the right (Vladcome). This T of covered arcades is one of the areas that are decorated during the Sendai Tanabata Matsuri, a very famous festival that takes place in the city every year in August. In the map at the bottom you can check the exact position of all these covered arcades. A small road about 500 meters away from Sendai Station (west exit) which houses about seventy stores of fruit, vegetables, flowers, fresh fish and food in general. Someone also sells ready-to-eat food, such as onigiri or sushi packs. The name of this market in Japanese simply means "morning market", but the shops are open until late afternoon. The AER Building is a skyscraper 2 minutes walk from the west exit of Sendai station, and is the second tallest building in the city (145 meters). In the first four floors there are various commercial activities, in particular the large bookshop Maruzen (1F) and the only Pokemon Center of the whole Tohoku region (3F). 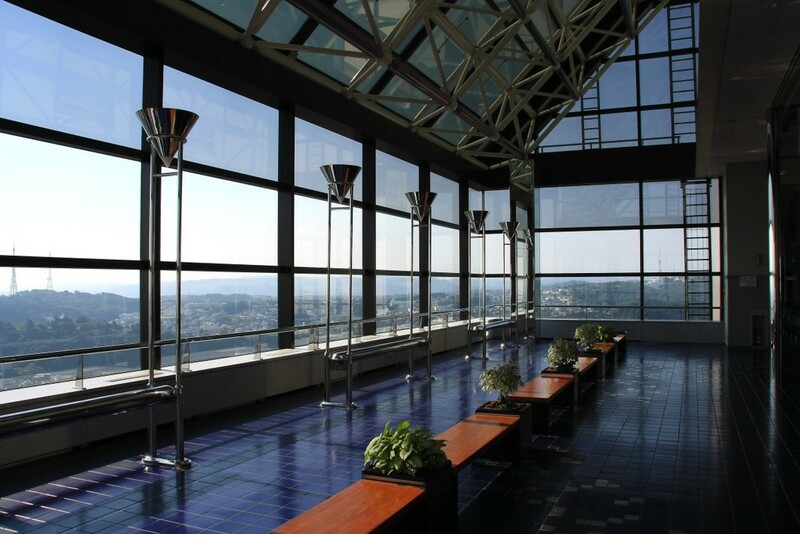 On the 31F there is a free observation deck (opening hours 10-20). You can access two different observatories, one facing north, the other facing south. The observatories are furnished with plants and wooden benches, the environment is nice and from sunset to closing becomes very popular among couples. Another skyscraper, located about 800 meters away from the west exit of Sendai Station. This is an office building, but on the top floor (30F) there is a panoramic observatory (free admission, opening hours 7-23), and a restaurant. The observatory has several benches to sit on, is about 128 meters high and faces south, while the restaurant faces north. To reach the 30th floor easily, look for the glass elevator that goes up directly to the top floor. 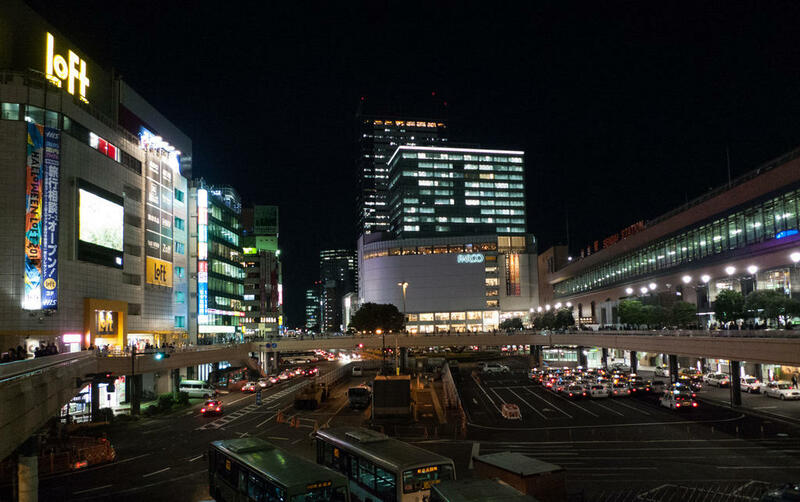 Kokubuncho is the area of nightlife in Sendai and the largest one in the Tohoku region. It is located, more or less, between Jozenji Dori and Hirose Dori, 1 km or so away from the west exit of Sendai Station. In this area you will find a lot of restaurants and izakaya of all price ranges and all kinds of cuisine. The area is popular with students as well as typical employees who come to eat and maybe to get drunk with colleagues after work. You will find the typical yakitori restaurant as well as English pubs or Italian restaurants. In the area there are also several pachinko parlors, karaoke, games centers, and also many red light establishments. Not real prostitution, but above all those typical places for adults like hostess bars, strip clubs and other things like that. A tree-lined avenue, landmark of Sendai. 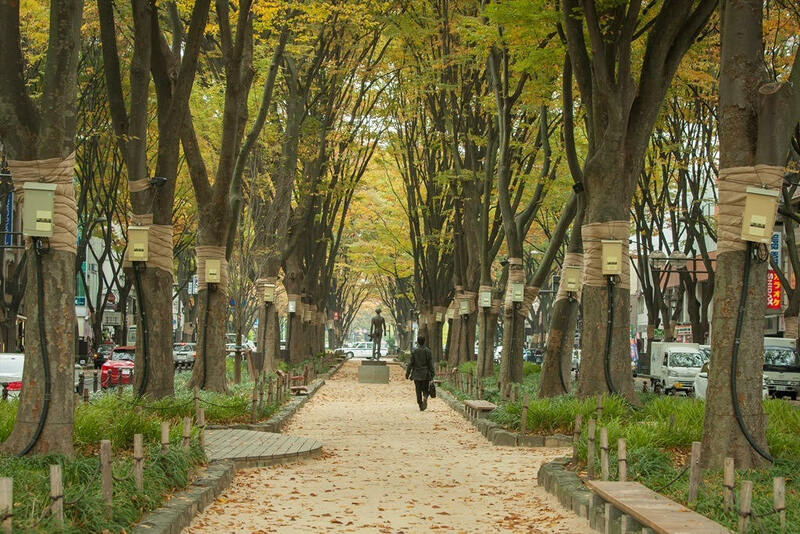 The street is surrounded by zelkova trees, benches, and a number of sculptures created by the Italian artist Emilio Greco. During the year, various events are held along this street, such as the Jojenji Streetjazz Festival in the fall season, or the Sendai Pageant of Starlight in december, when all the trees are decorated with fantastic Christmas illuminations. The Sendai Mediatheque is a multi-purpose building that houses, among others, a large library and a small art gallery. It is probably the building with the highest architectural value of the whole city of Sendai. 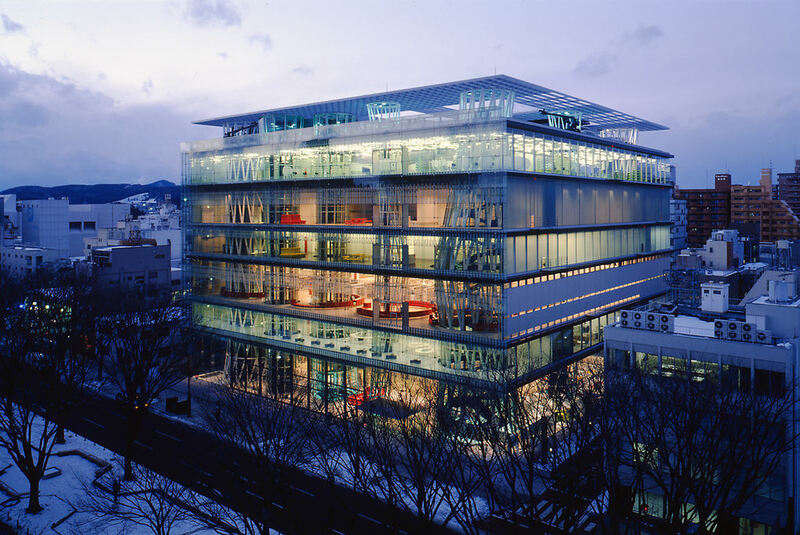 It was designed by the architect Toyo Ito in 1995 and completed in 2001. There is a lot to write on the details of this building. If you are passionate about architecture, we recommend reading the article by Archdaily. As tourists, you can freely enter and explore the building, and take a rest in the sofas and armchairs in the atrium or in the cafe inside. It is located about 2 km west of Sendai Station, 600 meters from Kotodai Koen station (Namboku line of the subway) and in front of the bus stop #14 of the Loople Sendai bus. An art museum of considerable size, which can be divided into at least three areas. A first area houses the permanent collection of the museum, which includes many works by artists related to the prefecture of Miyagi and the Tohoku region, as well as works by foreign artists, the most famous of which are Kandinsky e Klee. Another area of the museum (Churyo Sato Gallery) is entirely dedicated to Churyo Sato, a famous contemporary sculptor (1912-2011) born in Miyagi who in 1990 donated many of his works to the museum. There is also an area where temporary exhibitions are occasionally inaugurated. Finally, outside the museum there are several gardens with different sculptures. Overall it is a museum where you can spend a couple of hours pleasantly. If you are passionate about art, inside you can also visit an atelier open to the public, and maybe have a chat with local artists. This museum is located about 2.5 km west of Sendai Station. You can easily get there by subway (Kokusai Center station the nearest stop) or by using the Loople Sendai bus. Sendai is certainly not a place famous for temples and shrines, but if you want to visit a religious building, this Shinto shrine is one of the most interesting ones. The main building is considered a national treasure, because it is one of the few surviving architectures in the style of the Azuchi–Momoyama Period (1568–1600). The shrine was built between 1604 and 1607 at the behest of Date Masamune, powerful feudal lord who for its construction hired the most skilled craftsmen from Kyoto and other areas of the country. The main building is covered in black lacquer, gold leaves and bright colors. In this shrine, various festivals take place during the year, in particular the Dontosai on January 14 of each year, when a big bonfire is set up to burn all the New Year's decorations. This place is quite far from the city center, but you can easily reach it by taking the Loople Sendai bus or even with a normal city bus. The area to the west of Sendai Station is the best place to stay for a trip to this city. Visit the page Where to stay in Sendai for some tips on the best hotels and how to save money. Sendai Station is the main station of the city and is served by several local railway lines, by the Sendai Airport Line to/from the airport, and by the two metro lines of the city (Namboku Line and Tozai Line). Sendai station is also the only stop in the city of high-speed shinkansen trains connecting Sendai with Tokyo, Akita and Aomori. Another useful station in the large central area west of Sendai Station is the metro station Kōtōdai-Kōen station (Namboku Line), near the Sendai Mediatheque and Kokubuncho. For more information on how to get to Sendai from the rest of Japan visit the page How to get to Sendai.